This week a mysterious parcel was delivered to Primary 1. It came all the way from the North Pole from Santa. Santa sent a special “Santa Cam” badge for Miss Lawrence to wear so that he can check that the children are working hard in class and being kind to one another on the run-up to Christmas day. Today, we listened and watched author/illustrator Alison Murray read her Bookbug award shortlisted book ‘Hare and Tortoise’. Inspired by her book, we decided to draw our own self portraits including descriptions of our features. As part of Book Week Scotland 2016, all P1’s received a Bookbug Family Bag. This Bag contains three brilliant picture books, all shortlisted for The Bookbug Picture Book Prize 2017.
an activity booklet filled with games and activities for you and your child to enjoy. Colouring pencils to use with the activity book or on their own. A magnetic whiteboard with a set of magnetic numbers and a whiteboard pen. A voting slip so your child can choose and vote for their favourite book in The Bookbug Picture Book Prize. To receive our book bags and listen to the three picture books being read, we took a trip to Mearns library. We also helped the librarian to sing some of our favourite Bookbug songs. In the afternoon, they were given the opportunity to share their stories with the rest of the class and tell them just why they love them so much. Book Week Scotland 2016 got off to a great start this week. On Monday we came to school with our favourite book and got dressed up as a character from it. Everyone looked great and made a big effort, including the teachers. We had a great time and look forward to the rest of Book week. Inspired by the characters in the Funnybones book by Janet and Allan Ahlberg, we decided to go outside and create some art. Using natural materials that we found in the playground such as leaves, twigs, stones and even apples, we created our own skeleton characters. We worked in groups, pairs and individually to make our skeletons, giving them names and personalities. Inspired by our Autumn walk yesterday and all the colours we saw, we decided to make some art out of the leaves we collected. We used the leaves to make bushy squirrel tails and prickly hedgehogs. We are very proud of our finished artwork. Yesterday we took a walk around the school grounds to look for any signs of Autumn. It was a cold day so we wrapped up warm in our coats and hats. We looked up at the trees and noticed their leaves have changed colour. There were lots of crunchy leaves lying on the ground too. We collected lots of leaves together so that we can make some art back in the classroom. 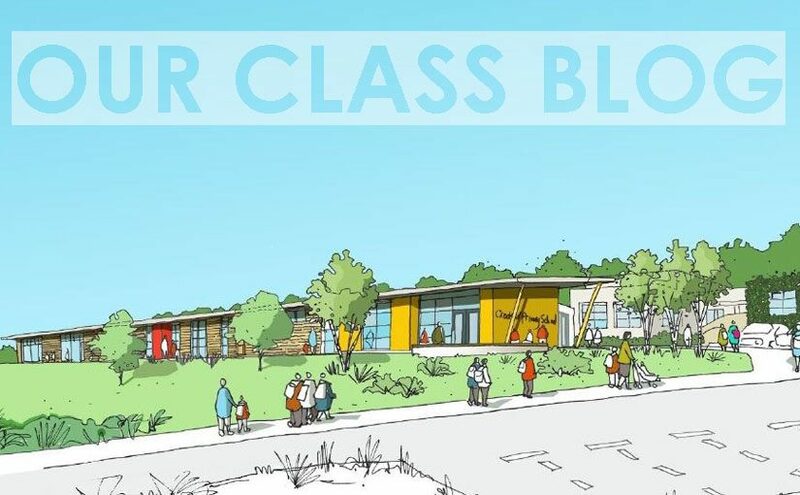 Welcome to our class blog! This is where we get to share with our family and friends all the fun and exciting things we are learning at Crookfur Primary School. We would like to wish all our children and their families a happy October holiday, and look forward to seeing you all again on the 24th.